Our club has deep roots not only in obedience training but also in tracking. For those of you who are not familiar with this dog sport, tracking consists of a dog and handler team following a human trail and finding “lost” articles such as a glove or piece of leather. There are varying levels of difficulty, and in CKC trials dogs can compete for Tracking Dog (TD) and Tracking Dog Excellent (TDX) titles run mostly in fields – cut hay fields are the best – and for corresponding urban titles (UTD and UTDX) in urban settings. Our club hosted its first tracking trial back in 1956, in fields off Henderson Road in Victoria. This test is historic because it was the first tracking test held in western Canada. Hosting a field tracking trial requires space, lots of space! In a trial, each dog runs its own individual track, and several acres per track are needed for the nearly 500 m long TD tracks and even more for the nearly 1000 m long TDX tracks. With farm lands diminishing at a rapid pace, many clubs are struggling to secure suitable fields for their trials. We have been fortunate indeed! 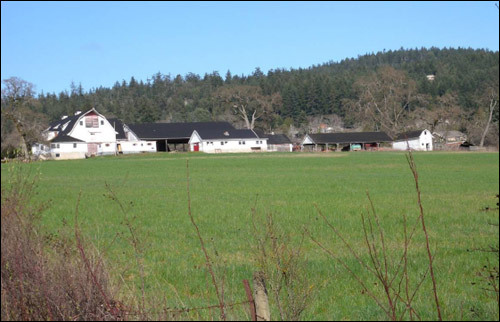 For close to three decades, the setting for our annual tracking trial has been Woodwynn Farm, a 192-acre heritage farm located in the Mount Newton Valley on Saanich Peninsula. Nestled high on the gently sloping hillsides above Hagen Creek and overlooking Saanich Inlet, the setting is picturesque. The rolling terrain where the wind swirls the scent, wide open fields, and scattered majestic old oaks provide just enough variety to make tracking at the farm both interesting and challenging. The lands around and within Woodwynn Farm are part of the Douglas Treaty Lands, which James Douglas purchased from the First Nations in mid-1800s. The Woodward family of the department store fame carved out the farm, which remained in the family for about a century until 1988. The name of the farm appears to be an amalgamation of two branches of the family, the Woodwards and the Wynns. Our club’s first tracking test at the farm was held in September 1981, with blessings from the owner A. B. Russ. That year ten TD tracks were laid at Woodwynn Farm; two TDX tracks were at a nearby site in R. Gregory’s fields off Mt. Newton X-Road. In 1984, the tracking trial became known as the Don Hudson Memorial Tracking Trial in honor of Don Hudson Russ, who together with his wife Molly, was among the founders of our club and who, incidentally, also had a family connection to Woodwynn farm. By this time, all the tracks (TD and TDX) were in the Woodwynn fields and spread over much of the farm’s lands. In 1988, the farm was sold to John Arnaud. Mr. Arnaud and his nephew Paul Gotto, who later managed the farm, generously allowed us to continue using the farm for our fall trial every year for the next 20 years. 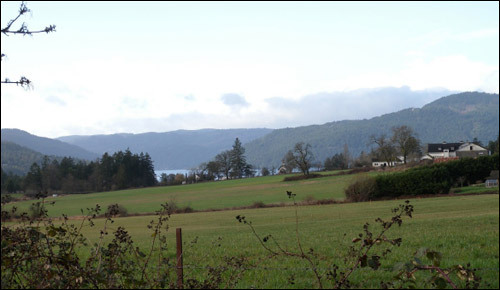 The fate of the farm became a hotly contested issue after it was put on sale a few years ago, with the Tsartlip First Nations band, neighbourhood groups, local governments, and other interested parties all weighing in their views on the future of the land. In March 2009, the farm was purchased by the Creating Homefulness Society, a non-profit organization that aims to run the farm as a therapeutic community, helping motivated homeless people to get off the street for good and transform their lives, and as an organic farm. The idea is to provide the clients an environment that is a polar opposite of their former street life and give them an opportunity to learn new skills while working the land in a sustainable way. The project also aims to maintain and restore the farmland through good organic farming practices, while, hopefully, also maintaining environmental values of the land. The project is spearheaded by Richard Leblanc, executive director of the Creating Homefulness Society. The board of directors of the society includes many dedicated and talented people, including the world-class rower Silken Laumann, who are committed to this cause. Richard kindly let us hold our tracking test again at Woodwynn Farm in October 2009, and we hope to be back in 2010. Through all the changes in ownership, farm management, and controversies, our annual tracking trials have endured, and every fall dogs have continued to sniff their way through the maze of scents in the beautiful Mt. Newton Valley. Over the years, we have been at the farm in drenching rain, soaked to the skin; we have plotted tracks on misty mornings with the fog so low and thick that all the landmarks are obscured; we have also been there on crisp fall mornings with the rising sun lighting the fields so brilliantly bright that trying to follow the dog’s progress hurts the eyes. From 1981 to 2009, dogs and their hopeful handlers have run 188 TD tracks and 86 TDX tracks on these fields. Overall, the pass rate has been 46% for TD and 25% for TDX. The dogs have been of various breeds, which in addition to traditional tracking breeds include several that do not immediately come to mind as tracking dog prospects. Here they are: Alaskan Malamute, Bearded Collie, Belgian Tervuren, Bouvier de Flandres, Bernese Mountain Dog, Boxer, Bulldog, Cairn Terrier, Chinese Crested, Coton de Tulear, Dalmatian, Doberman Pinscher, English Springer Spaniel, English Cocker Spaniel, English Pointer, Great Dane, Great Pyrenees, German Shepherd, German Short-haired Pointer, Golden Retriever, Irish Setter, Kerry Blue Terrier, Labrador Retriever, Leonberger, Lhasa Apso, Miniature Pinscher, Miniature Schnauzer, Norfolk Terrier, Newfoundlander, Pembroke Welsh Corgi, Pomeranian, Rottweiler , Rough Collie, Shetland Sheepdog, Soft Coated Wheaten Terrier, Standard Poodle, Standard Schnauzer, Papillon, Silky Terrier, Vizsla, and Weimaraner. Tracking trial judges receive special recognition, because it is their diligent plotting of the tracks and fairness that makes the trials both fun and a learning experience for the participants and spectators alike. At Woodwynn Farm, our tracking judges have been Ben Taylor, who judged the very first trial at this location in 1981, Ian Hall, Mary Bates, Irene Bourassa, Gary Roe, and Joanne McLeod. Gary and Joanne have been judging our trials in alternate years since 1986, and both started their judging careers at Woodwynn Farm. To date, Gary has been our judge 12 times and Joanne 11 times! We can only applaud their commitment to tracking and to our club. In light of the history of tracking at GVDOTC, I am a newcomer to the scene. My personal involvement in tracking began in September 2000, when I arrived at the tracking trial at Woodwynn Farm as the prospective owner of a 2 week-old golden retriever puppy! Two years later I was a participant in the trial, where Laika pulled me to the final glove, despite poor handling and much trepidation on my part. I have been hooked to the sport ever since and have missed only one of our annual tracking trials (but for a good excuse; in 2004, Laika and I were earning our American TDX at a test in Fort Lewis, Washington! By the next fall, however, she had already passed on to greener tracking fields, a reminder of our fleeting time on this earth). Going through the boxful of records from our past trials made me appreciate anew the vast amount of volunteer work that goes into organizing and running a successful tracking trial. Thanks to the efforts of a small but dedicated group of club members, past and present, we have been able to continue our tracking tradition through the years. If you are new to tracking or would like to see what it is all about, there is no better way than to watch a trial, or if you are so inclined, help out laying a track! Of course there would be no tracking trial without a suitable venue with vast open fields. Hence, we thank Richard Leblanc for his interest in our sport and letting us continue using Woodwynn Farm for our tracking trials, even while the farm is in the midst of a major transformation into new uses. If you want to learn more about what is happening at the farm and future plans, please visit the Creating Homefulness Society’s website (www.woodwynnfarms.org). You can support the projects at the farm through a charitable donation; an anonymous donor has pledged to match all donations received by 9 May, dollar for dollar, so now is a good time to show our support! Thanks to our tracking committee members Mary Harkness, Maralyn Redford, Liz Taylor, and Amalie Bush for providing input and information and for Richard Leblanc for reviewing an earlier draft.